Along the winding road of La Strada Del Sagrantino, wine estates proudly dot the route with their signs. Vineyards with their perfectly lined vines can be seen on both sides of the road and they change color as the seasons change. My favorite is when the autumn colors start painting the Umbrian landscape with its splashes of vibrant orange, rust and yellow. 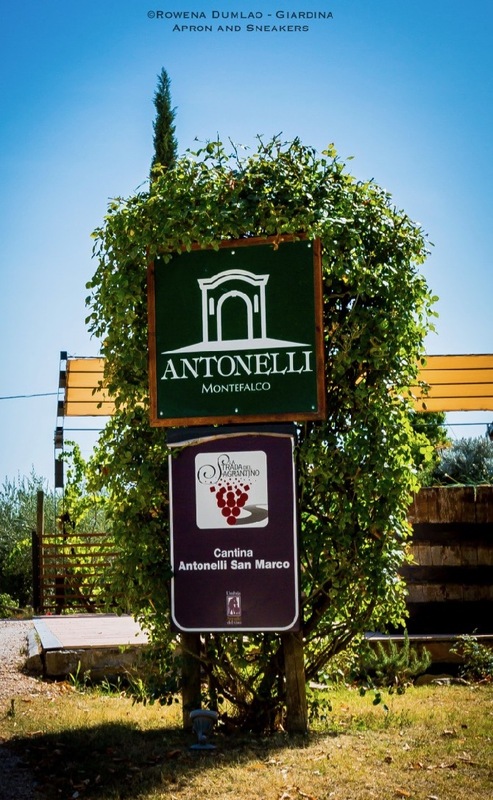 One of the wineries along the route is Cantina Antonelli, a 170-hectare wine estate located centrally within the Montefalco's DOCG area. It has been with the Antonelli family, a family of lawyers, since 1881. 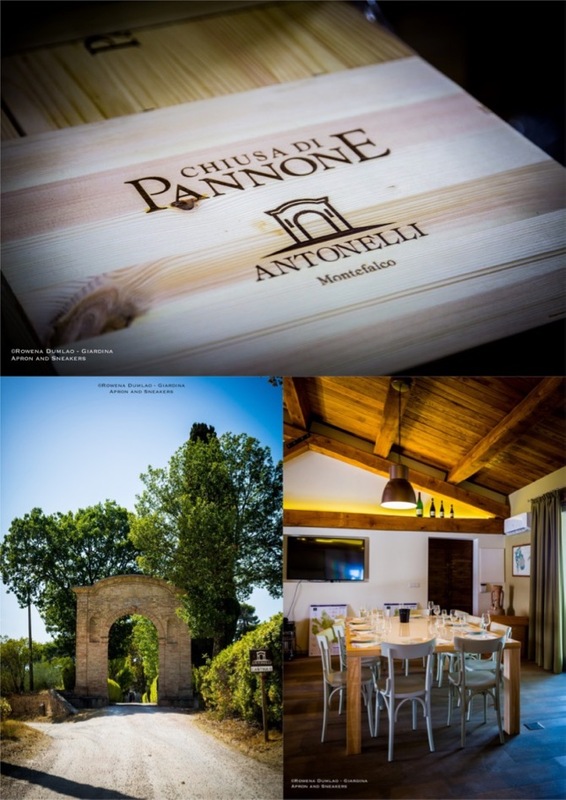 Originally from Spoleto, another Umbrian city, Francesco Antonelli bought and transformed the property to vineyards. The succeeding family members, Stefano and Marianna maintained what Francesco started. Soon after, Giacomo and Antonio enlarged the property and invested in viticulture. At present, Filippo Antonelli has been at the helm of the wine estate since 1986. 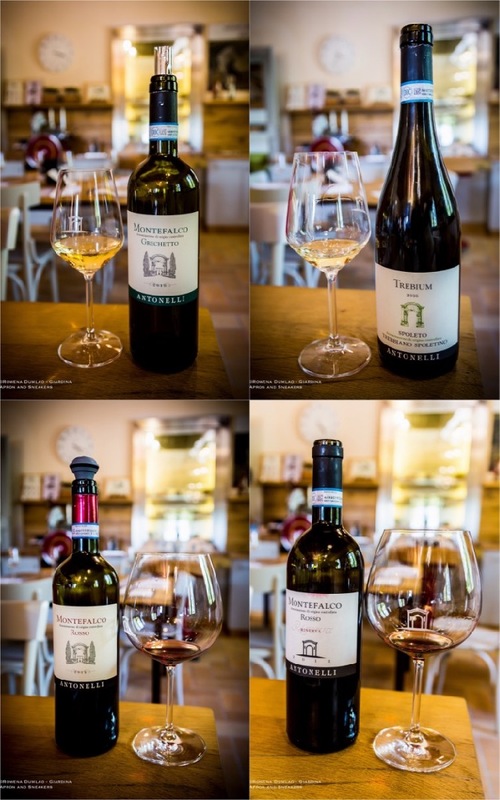 Aside from Cantina Antonelli, the family also has another winemaking estate in Lazio, Castello di Torre in Pietra producing Lazial wines. Emphasizing the importance of his region, he also served as the president of the Consorzio Tutela Vini Montefalco (Montefalco Wine Consortium). 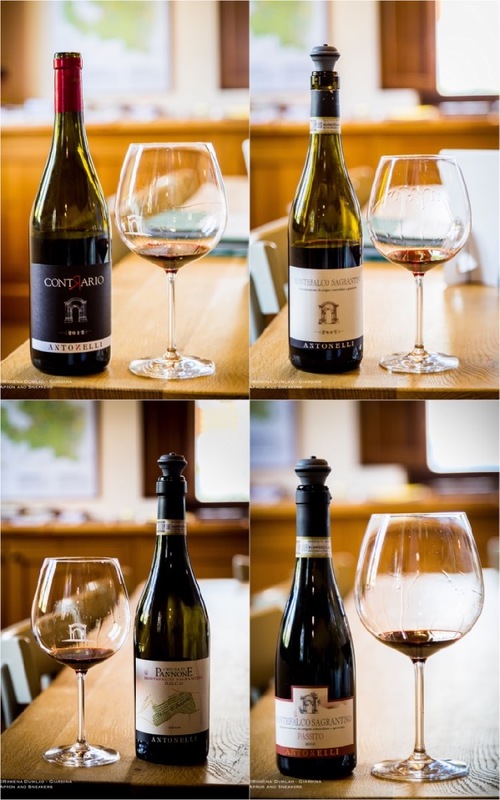 During my visit to Cantina Antonelli, I had the pleasure to try 8 of their wines from the fresh, fruity and floral Grechetti to the full-bodied intense Sagrantino wines after a visit to their underground fermentation rooms, wood and bottle aging areas, and the final phases of production. Most of the vines are trained with the Guyot method while the rest are trained with cordon spur pruning method. 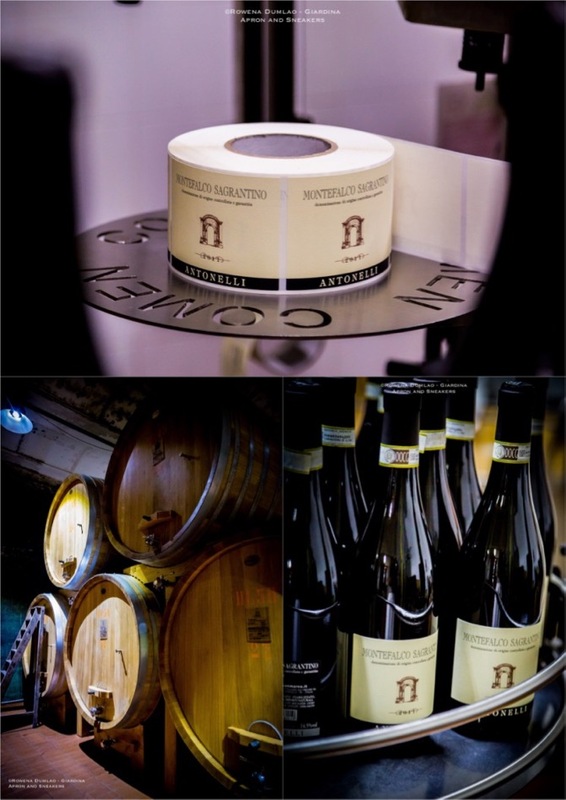 The Montefalco Grechetto DOC 2016 is a straw yellow wine with 100% Grechetto, fermented in stainless steel then aged in bottles for 3 months. A fresh white wine with aromas of yellow fruits and flowers and nuances of peach and citrus fruits. The Trebium Trebbiano Spoletino DOC 2016 is a golden yellow wine with 100% Trebbiano Spoletino, fermented and aged in large Slovenian oak barrels then in bottles for another 4 months. This wine has complex and intense aromas of tropical fruits and a dominant nuance of mature pineapple while on the palate, it has very good freshness and minerality and excellent persistence. The Montefalco Rosso DOC 2014 is a blend of 70% Sangiovese, 15% Sagrantino and 15% Montepulciano. 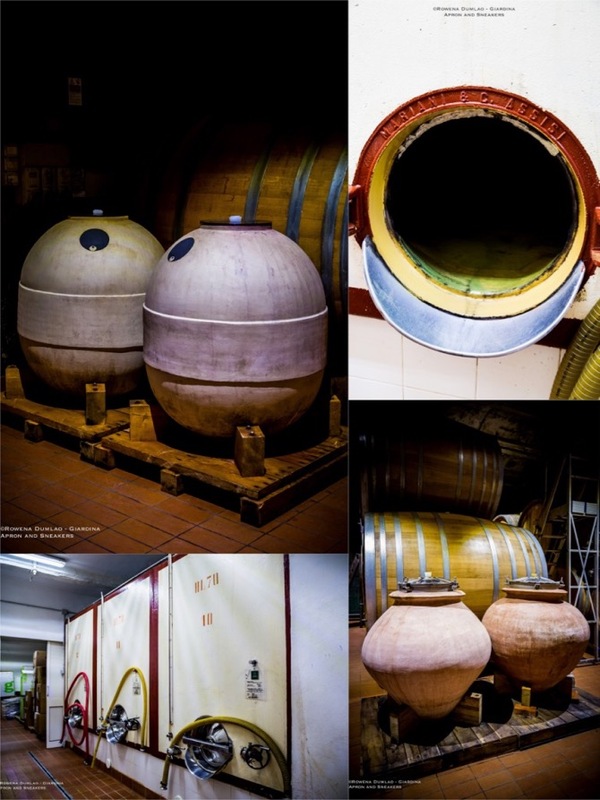 The grape varieties were vinified separately then blended and aged together in large oak barrels for 1 year, clarified in cement vats for 6 months then aged in bottles for another 6 months. It has a strong ruby red color, intense aromas of cherries and dark fruits and nuance of vanilla whereas to the palate, it's tannic, fresh and sapid. The Montefalco Rosso Riserva DOC 2011 has the same components as the previous Montefalco Rosso but the Riserva is produced only with the best vintages of Sangiovese. It has a much more intense ruby red color with specks of garnet, complex and intense to the nose giving notes of spices, mature and jammy dark fruits and flowers, fuller body with manageable tannins, smooth in taste and remarkable persistence. 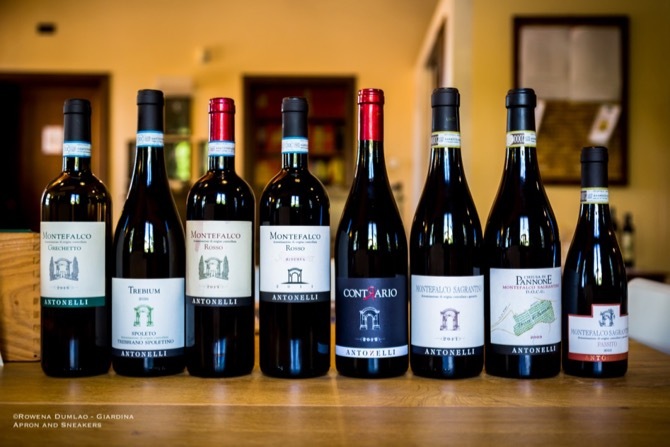 The Riserva is aged differently from the Montefalco Rosso because the blended varieties are first aged in lightly toasted French tonneaux for 6 months, then to larger oak barrels for 12 months, clarified in cement vats for 6 months and finally, aged in bottles for another year. The Contrario Umbria Rosso IGT 2012 is the starter for 100% Sagrantino wines. The grapes were harvested from young vines which are actually around 15 years old. After the fermentation, it was aged in stainless steel vats for 18 months then clarified in cement vats for 3 months and the final aging in bottles for 6 months. It has an intense ruby red color with aromas of citrus, herbs and red berries while on the palate, it's fresh and sapid with prominent tannins. 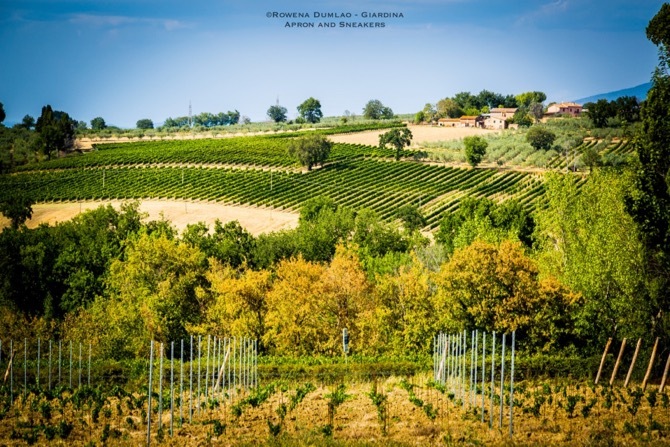 The Montefalco Sagrantino DOCG 2011 came from centuries-old vines that are grown on the slopes of Umbrian hills that are characterized by structure and longevity. After fermentation, the wine is aged in lightly toasted French oak tonneaux for 6 months, then in larger Austrian oak barrels for another 18 months, clarified in glass-lined cement vats for 12 months then left to age in bottles for the final 24 months. The final result is an excellent representation of Sagrantino with complexities to the nose giving notes of dark jammy fruits especially cherries and berries, herbs, and ethereal nuances, firm tannins and very good structure. The 2012 vintage won the gold medal as the best biological wine in the world in the International Organic Wine Award 2017. The Chiusa di Pannone Montefalco Sagrantino DOCG 2009 comes from grapes grown in the Chiusa di Pannone vineyard at 400 meters above sea level. After the fermentation, the wine is aged in lightly toasted French tonneaux for 6 months, then in large oak barrels for 24 months, clarified and left to settle in glass-lined cement vats for 6 months, and a final aging in the bottle for 2 months. The result is a garnet red full-bodied wine with complexities to the nose. Notes of ethereal aromas, dark jammy fruits, herbs and spices while to the palate, it gives a smooth finish and distinguished tannins. The Montefalco Sagrantino Passito DOCG 2010 is a sweet wine made from semi-dried Sagrantino grapes. 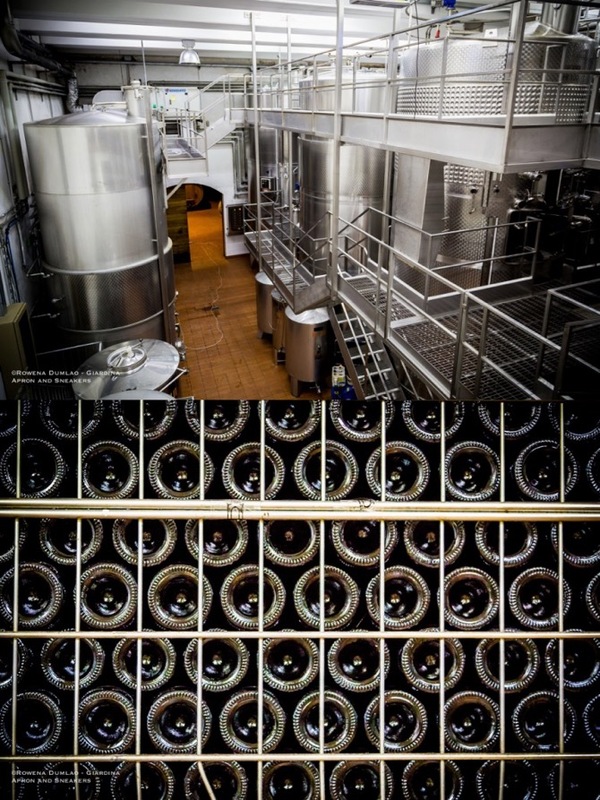 Dried in wooden crates for 35 days then aged in large oak barrels for 12 months, clarified in glass-lined cement vats for 18 months then aged in bottles for 12 months. Garnet in color, robust in body, rich and complex to the nose with notes of dark fruit jams and spices and gives a lovely freshness to the palate in the end. 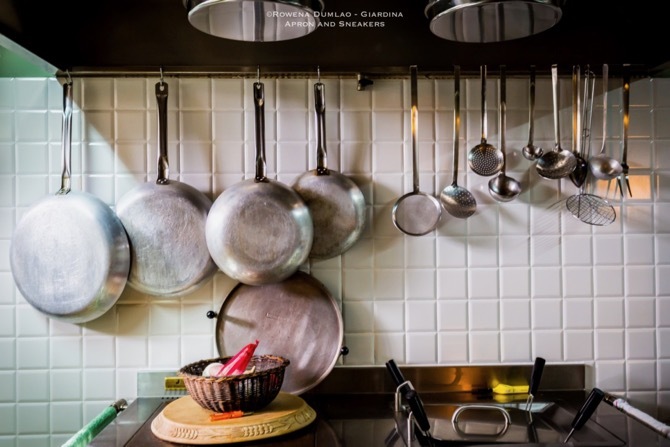 At the wine estate, it is also possible to take cooking lessons at the cooking school, Cucina in Cantina. To seal the integration with Umbrian enogastronomy, it's perfect to have a hands-on approach to learn how to make fresh pasta and local Umbrian dishes with a team of expert home cooks under the coordination of Wendy Aulsebrook, a home economist and food stylist originating from Australia. 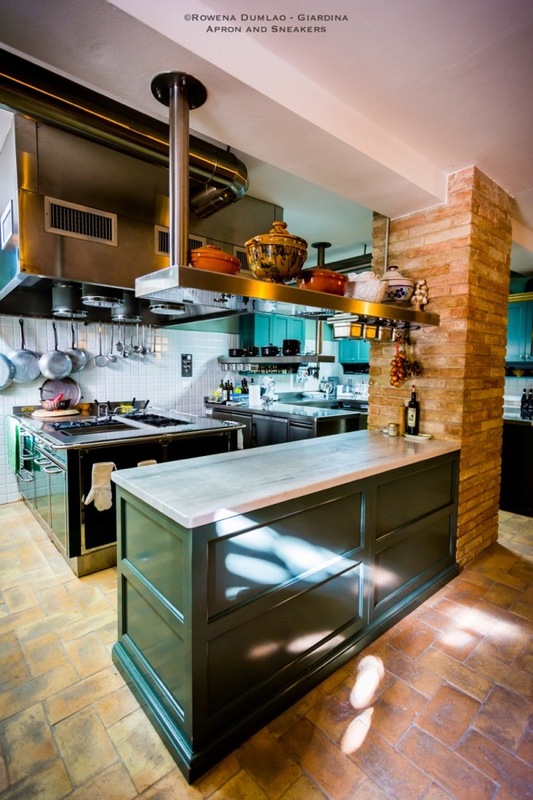 The kitchen I visited is spacious and fully-equipped with a cozy and rustic atmosphere. 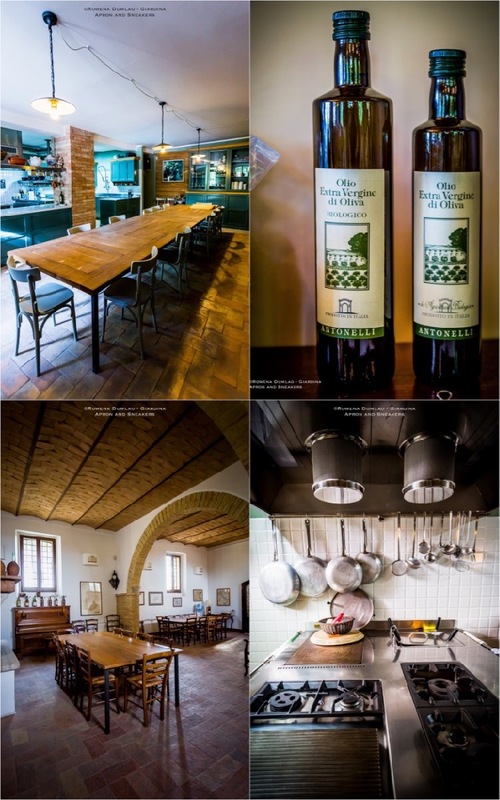 Check in advance about booking some cooking lessons, or a wine tasting and cellar tour.